Mars - Kdo bude první? 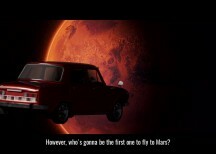 Mars – who´s gonna be the first one? Mars – who´s gonna be the first one is a recruiting spot of Faculty of Mechanical Engineering of Technical University of Ostrava, which presents the client in a much better light than the potential applicants have tendencies to see. Graduates are no longer a bunch of dirty miners. The faculty offers a large scale of perspective fields of study which hold a great future. Have you thought about the fact that one of the first people to set their feet on Mars are to be geodesist or geologists? Online spot Mars – kdo bude první je náborový spot Hornicko-geologické fakulty VŠB-TUO, který klienta ukazuje v lepším světle, než v jakém ho vidí potenciální uchazeči. Už to dávno nejsou špinaví horníci. Fakulta nabízí řadu perspektivních oborů s velkou budoucností. Věděli jste, že jedni z prvních lidí na Marsu budou geodetové, geoinformatici a geologové?